I have been organising a great open day event on the 10th of September. The times are between 10am and 4pm and is located at the Mind and Body centre. There is lots planned for this great open day and I am really excited about it. There are some wonderful free goodies available on the day such as a free zinc deficiency test (if you want to know what zinc deficiency does go to the bottom of this page) There is also free fresh home grown herbal teas to taste (not like the old dried up types that are found in the supermarkets) with this there will be a explanation on the qualities of these herbs. On the day there will also be a fantastic free taster session of one therapy. And on top of all that you can buy vegan food supplied by Barley Twist l. Haven't I done well? So if you want to experience all these things and have all these great benefits of this great day then buy your tickets they are only i said only £2.50, and just so i can get a accolaide fo alrl the hard work i have been putting in, if you pre book your ticket i will personally give you a 20% off voucher to spend ongoods the day (this cannot be use in conjunction with any other offer). If you have energy levels that are going up and down leaving you feeling tired and a bit low, or maybe you are getting lots more colds and viruses, or your body does not heal as well as it used to, or maybe your food doesn't taste as goodl as you used to. All these can point to a zinc deficiency. n the day you can come and have a free zinc deficiency test which will enable you to see if increasing your zinc intake could improve your life! A Belgian music festival will go vegetarian for 24 hours to appease headliner Morrissey. Lokerse Feesten has banned meat from its food stalls on 4 August to celebrate the arrival of Manchester's most famous animal-rights activist. Festival organisers had long "dreamed" of booking Morrissey, they said. "Many months we worked on it, for weeks we waited for an answer, many nights were spent sleepless." At last, the former Smiths singer agreed, but with one stipulation: on the day he performs, the festival will be meat-free. Bosses called it "a welcome catering challenge". The result is an imposed "healthy break" at the festival, with organisers planning "an array of vegetarian dishes". Gone are the horse-meat sausages and, er, snails. Instead, we assume, festivalgoers will enjoy hummus, roast peppers and tofu burgers. Food stalls outside Feesten grounds, organisers warn, "are not affected by [the meat-free edict] and will offer their usual products". 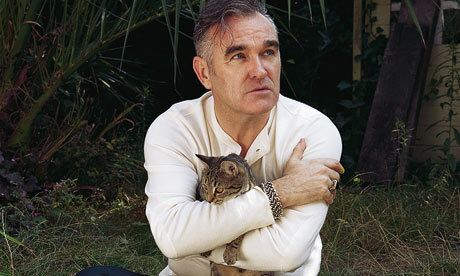 A vegetarian since he was 11-years-old, Morrissey has been a staunched advocate of meat-free eating and animal rights. He has boycotted Canada due to the country's annual seal hunt and walked off stage at Coachella festival in 2009, complaining about the aroma of barbecued meat. "I can smell burning flesh," he told the crowd, "and I hope to God it's human." 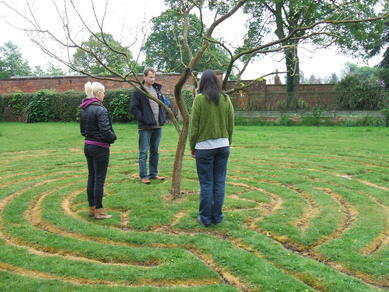 We have just returned from a fantastic weekend at our first retreat in Ellesmere, Shropshire, We got excellent feedback without exception and from seasoned retreaters. What we liked most was getting to better know the Yogis who have been regularly coming to our classes, some for several years. Some people have never met as they attend different classes. It was also lovely to see how easy it was for everyone to integrate into the group. We were really impressed by the openess and friendliness of all participants. 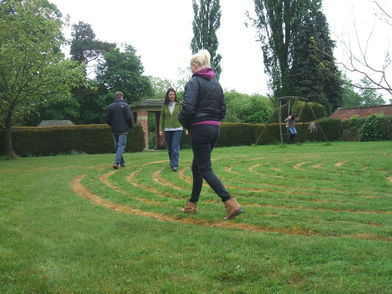 On the first evening we took an orienteering stroll around the 10 acres of grounds which led us through woodland, kitchen and herb gardens, the sunken garden and the lawns. 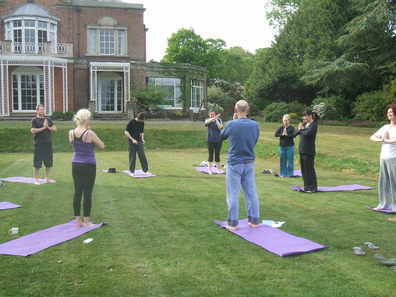 It was undescribably exhilerating to experience yoga on the lawn surrounded by a backdrop of nature. 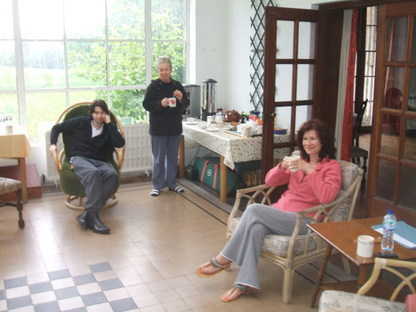 Casual breaks in the sunny conservatory with fantasic views over the grounds. 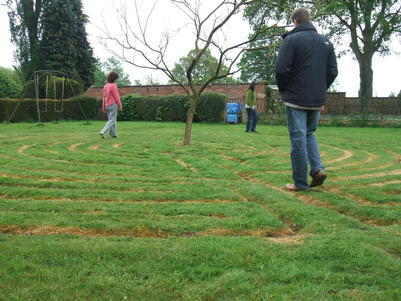 Walking the labyrith was inspiring for all those who tried it. You can even catch someone taking a swing while they wait their turn if you look closely. Activities were almost continuous throughout the day and although people were encouraged to do their own thing most were up for the pre-breakfast yoga sessions and then joined in with all the planned activties throughout the weekend. There was lots of room for choices and some took advantage of this with individual sessions in addition to the group sessions. We had coaching and hypnotherapy sessions in the library on the first floor (fantasic views from the bay window), nutrition groups in the lounge and our light bonding activity sessions in the lounge too. 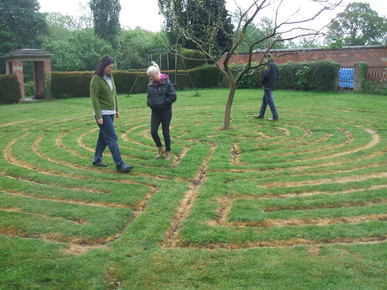 Our laughter workshop was held on the old tennis court lawn, just next to the labyrinth and beyond that was the sunken garden where we intended to hold a meditation session but didn't manage to dodge the rain. 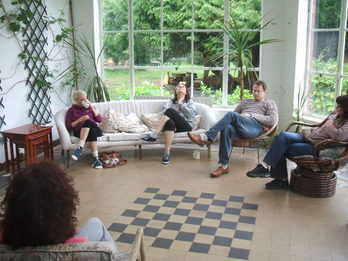 The laughter workshop was a great stretch of the comfort zones leaving participants feeling empowered and liberated. 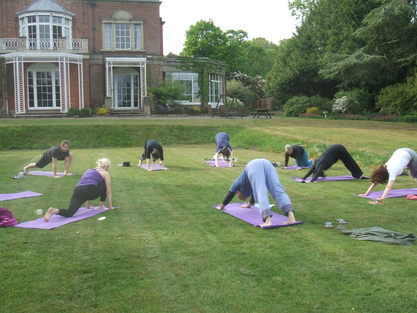 Yoga sessions were also held indoors and the Yin before bedtime ensured that everyone retired relaxed and ready for sleep. The country is on an economy drive. There are fears that a rise in petrol costs is on it's way and the knock on hits almost everything eventually. One way to help with this would be to walk more. Not only is it good for your pocket - also good for your health. A brisk 20 min walk every day could help to save your life. 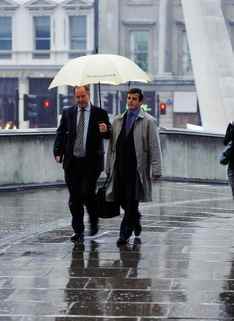 Why not make a pact now to save your petrol costs and walk a little more. Walking also helps you to learn to breath more efficiently and increase the oxygen intake into your system. This gradually builds up until you begin to feel the fitness within. I know that some have to drive to work and that walking takes a lot longer. Planning can incorporate the time consuming walk into your regime and the time you gain on this earth may be well worth it to you. Here is a calculator to see how much your petrol is costing you and how much it would cost if the price went up. If you work too far away to walk or riding a bike is not good then just park further away and make it a longer walk into work from your car. Work out how much you are saving by walking and put the money away - plan what you are going to spend it on. Make sure you walk out at lunch time even if it is only around the block. Incorporate a step counter into your routine and see if your steps are increasing as time goes by. Encourage your friends and family to also walk a little more. Take your family for a walk in the evenings. Please add any ideas you may have for helping with the walking blitz. The course consists of 12 modules at monthly intervals each main module is followed by three sub modules. Very simple to work with and with huge effects to the quality of your life and those around you - if you follow the simple techniques.